Banner Art by Evan Stickfort, "The Lowly Potato Farmer"
Volume I of the Tenth Muse was published in 2011. To read the entire first volume, click on the image below. To read individual excerpts from this volume, click on the button labeled "Volume I Prose and Poetry." 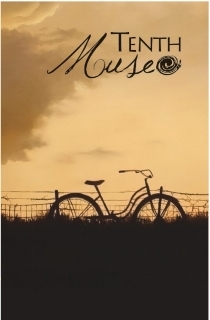 Volume II of the Tenth Muse was published in 2012. To read the entire second volume, click on the image below. To read individual excerpts from this volume, click on the button labeled "Volume II Prose and Poetry." Volume III of the Tenth Muse was published in 2013. To read the entire third volume, click on the image below. To read individual excerpts from this volume, click on the button labeled "Volume III Prose and Poetry." Volume IV of the Tenth Muse was published in 2014. To read the entire fourth volume, click on the image below. To read individual excerpts from this volume, click on the button labeled "Volume IV Prose and Poetry." Volume V of the Tenth Muse was published in 2015. To read the entire fifth volume, click on the image below. To read individual excerpts from this volume, click on the button labeled "Volume V Prose and Poetry." Volume VI of the Tenth Muse was published in 2016. To read the entire sixth volume, click on the image below. To read individual excerpts from this volume, click on the button labeled "Volume VI Prose and Poetry." Volume VI of the Tenth Muse was published in 2017. To read the entire seventh volume, click on the image below. To read individual excerpts from this volume, click on the button labeled "Volume VII Prose and Poetry." Volume VIII of the Tenth Muse was published in 2018. To read the entire seventh volume, click on the image below. To read individual excerpts from this volume, click on the button labeled "Volume VII Prose and Poetry."